DUNCAN – A new initiative on Vancouver Island is bringing together small-scale and commercial beekeepers to breed bees that are better adapted to the local climate and pest pressures. Led by Iain Glass, a master bee breeder from North Vancouver, the project is selecting local hives that demonstrate specific traits to develop queens on the Island for the Island. Rather than importing queens and nucleus colonies (nucs) to start new hives, Glass is teaching local beekeepers to select for specific traits and behaviours to develop their own queens and strengthen local bee populations. According to Glass, beekeepers should be building their stocks from only the top 3% to 5% of their hives, and getting rid of hives that are low to average producers, or that are susceptible to health issues. Hives on Vancouver Island are affected by varroa mite and a variety of the viruses that they carry, as well as three major bacterial infections: American Foulbrood, Chalkbrood and Sacbrood. 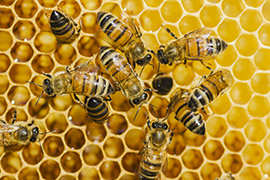 While chemical treatments are available for these issues, there are also natural bee behaviours that increase their resistance to infestation and infection. Some strains of bees, both domestic and feral, have developed a behaviour referred to as varroa sensitive hygiene (VSH). These bees can detect the presence of varroa mites and respond to manage them. In some cases, they can detect the varroa mite in the brood cell and will either kill the cell and get rid of it, or uncap the infected cells to disrupt the mite’s lifecycle. Other bees, known as “leg maulers,” engage in grooming behaviour outside the hive. When they see a bee with a varroa mite on it, they chew at the leg of the mite until it falls off and dies. “There has been a genetic adaptation with the blueprint of the bees that happens on a natural basis but the VSH traits can also be selected and bred for,” says Glass. Glass and his collaborators will also be testing for hygienic behaviour in local hives, an important trait that reduces or eliminates the impact of bacterial infections like American Foulbrood. Glass tests for hygienic behavior by freezing a chunk of brood with liquid nitrogen and observing how much of the damaged brood they remove from the hive within 24 hours. “Hygienic bees recognize the brood cells are dead and get them out as quickly as possible. If you go back 24 hours later and greater than 95% of the dead brood has been removed, the hive is considered hygienic,” says Glass. He adds that roughly 10% of the North American bee population carries this gene. Not only are these bees resistant to pervasive diseases but they are consistently excellent honey producers. “Hygienic behavior is fairly easy to select for and it exists in a fairly large population. If we went only to hygienic bees, we’d get rid of American Foulbrood, Chalkbrood and Sacbrood. It does not solve the varroa issue but we are looking for both varroa-sensitive hygiene and hygienic bees,” he explains. While the behaviours are linked to different genes, VSH bees tend to also be hygienic. Glass has presented to beekeeping groups across Vancouver Island promoting the project. He is gathering a core group of collaborators for a three-year learning cycle modelled after apprenticeship programs. In the first year for the project, he had 12 beekeepers on the project and and a further 20 people have expressed interest in his next advanced queen rearing workshop. By next summer, he expects to have 100 beekeepers participating in the project.